1. Performed the wedding ceremony for Jeff and Jess Senechal. Went amazing (see pics in previous post). 2. Left immediately after the wedding ceremony because I had to catch a flight out of Buffalo, NY. Drove through the back country of Canada. Got lost. Then found my way (thanks to the handy Google maps application on my phone). 3. 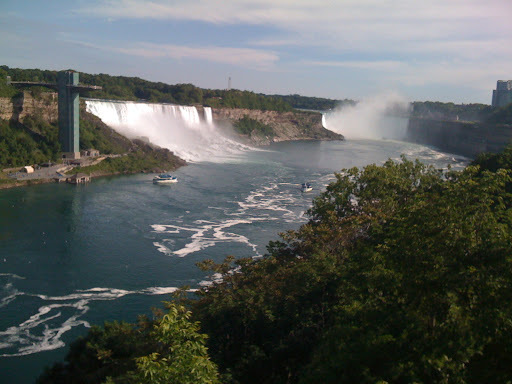 Finally arrived at the Canadian border at Niagara Falls. Had to return my rental car on the Canadian side of the Falls because you can’t return a Canadian-rented car in America without astronomical charges. 4. Found out that it was going to cost $90 for me to get from the Canadian border to Buffalo via taxi (30 minute drive). 5. I went to two different hotels and asked if their concierge could help me find a cheaper way to the airport. The nice lady at the Double Tree Hotel suggested that I walk across the Canadian/American border and then get a cab from America. 6. To get across the Canadian/American border, I had to cross over the Rainbow Bridge. Turns out that you need $0.50 to get across the bridge. I had just spent my final Canadian coins on a cup of Starbucks and had ZERO cash left. 7. I asked three different strangers for $0.50 (I was pretty motivated to get home). One guy said no immediately, then turned around (I think he felt bad because I was sweating profusely) and gave me two quarters. 9. Went through customs. This was surprisingly uneventful. 11. Got to chatting with the cab driver. He was a really nice guy from Pakistan. He gave me his business card halfway to Buffalo. It said “Love for all, hatred for none.” Call me sensitive, but I always figured that it was kind of a given that cab drivers didn’t hate me. So then I was a little creeped out. 12. Got to Buffalo with 50 minutes to spare. 14. Got home at 1:30am.